When did Rock ‘N Roll die? Was it when Jim Morrison expired in a Paris bathtub or when Bon Scott died of hypothermia after passing out drunk in his car? Listening to the radio makes a good case for one or the other as there are few bands played that existed much long thereafter. Sadly, it can all be attributable to the ugliness and greed of the incipit record industry that has always gone after the quick and easy dollar, especially forgetting the process of artist cultivation and development after the golden age of Rock. The case must be made, though, that Rock ‘N Roll did not die. Despite lack of radio or television support, bands like Octopus prove that the fires still burn and true Rock lives, thankfully! Hailing from Detroit (Rock City), Supernatural Alliance is the band’s debut album and is a strong entry into the game. The album’s title is quite fitting because the band has allied itself with the spirit of Rock that embodies the work of bands from Deep Purple to Uriah Heep, Black Sabbath to MC5. Kicking the door in, the album opens with “The Center,” a track that blazes from a “Children of the Grave”-type riff, smooth vocals from singer Masha Marjieh, and a trippy, face-melting solo of psychedelic bliss at the 1:25 mark, all of which give the listener the feeling of setting forth on a rocket-fueled, acid-imbibed trip across the celestial heavens. Track three, “Slave and Master,” is big on groove with its mesmerizing bass line, crashing cymbals, and big hooks from Ms. Marjieh that sink in leading the listener across the valley of the mind. The liquid exercises of the bass fills played up and down the neck shift the chords fluidly giving the song even more funk and groove. “Child of Destiny” is the fifth track, one where 80s synth sounds lay the foundation on which chugging guitars, plodding bass, snappy drums, and soulfully sassy vocals are laid. The juxtaposition of creamy, staccato guitar against 80s synth makes for a memorable romp that soon delves into 1970s Prog territory led by the (black) light of the lava lamp. More infectious vocal hooks give a mystical feel atop heavy guitars that worship at the altar of Tony Iommi and Jimmy Page on the sixth track, “The Unknown.” The fuzzy bass underneath the hypnotic guitar riffs evoke classic Badmotorfinger-era Soundgarden, and the blending of the smooth female vocals and hard-edged Hammond organ confirms the song as an instant classic. The eighth track, “All the Love,” is a memorable affair bred from gorgeous vocals replete with ample soul and emotion, though this time in the form of a ballad. Pounding fuzzy bass and haunting leads characterize the middle section where the song gets heavy, matched by beefy keyboard synth sounds that act on the cerebral and truly pull the listener in. Octopus are truly a force to be reckoned with. Instrumentally, the band benefits from a super-tight rhythm section made of solidly swinging drums and big classic Ampeg-driven bass. The guitars are a delicious combination of the meaty riffs of Iommi and Richie Blackmore with the resin-caked tones invoked from Kyuss-era Josh Homme. The keyboards in the way they lay down everything from classic Hammond organ tones to 70s and 80s synth sounds in the role of main melody and counter-melody added to the utterly infectious vocals set the band apart from other attempts at their ilk. Masha Marjieh is simply a sonic seamstress as evidenced across the ten tracks that span the album where at times her sound comes from the very well-spring of her heart and others are mired in tongue-in-cheek imagery. 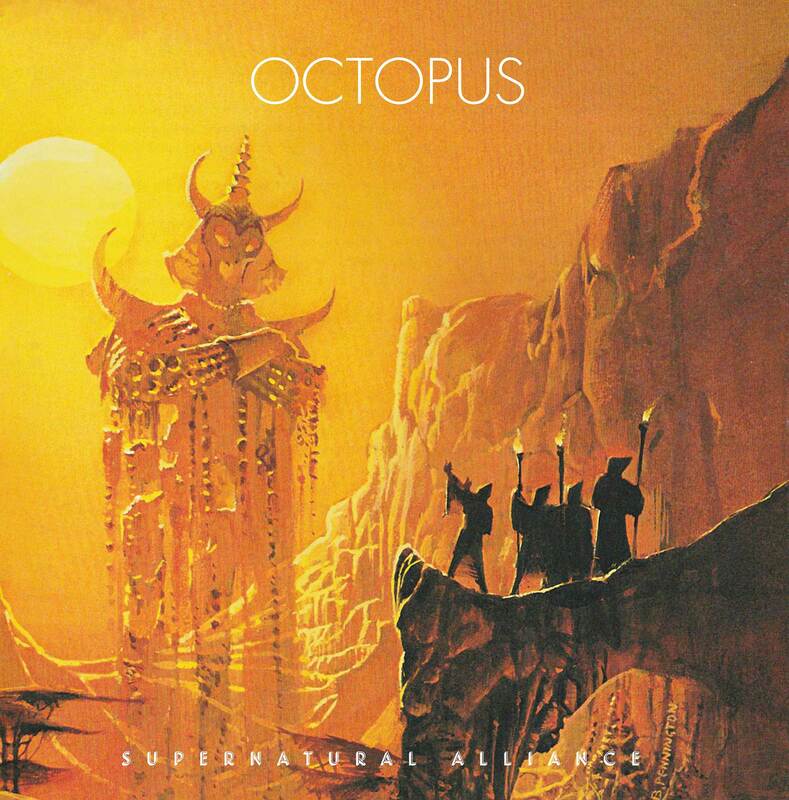 One would be hard-pressed to name a band that could compete with Octopus‘s brand of traditional Heavy Rock, a brand that is amazingly well-refined for this to be a debut. Perhaps the true test would be to see the band live, a wish only made more adamant by further listens to this stellar debut.